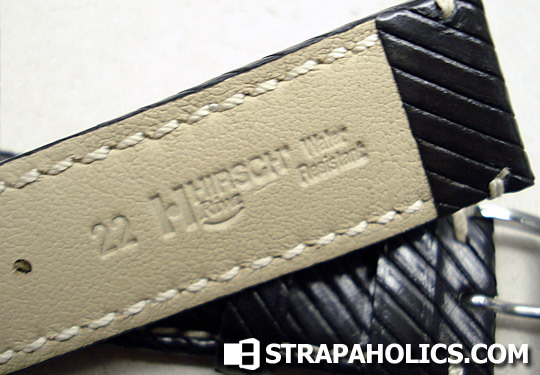 Hirsh is the largest of the Austrian strap companies, and makes some of the best production aftermarket straps available – especially for the price. While their products may not compare to the stuff from ABP and other high-end strapmakers, we must consider that their price point is much lower, and their straps are mass-produced, not custom-crafted. 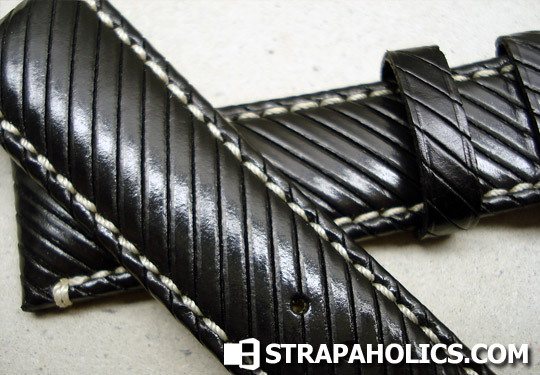 The Riva is an example of a great value strap with lots of character. The immediate comparison that comes to mind is the Panerai Riva strap, which is without a doubt a higher quality strap. If we consider that the Panerai Riva costs 3-4 times more, then the Hirsch Riva becomes more attractive, however. When carefully examining the quality of the leather, its quite obvious that the Riva is not up to the standards of the Panerai Riva, but its a great strap for MRSP of $99.95, which can be had for about $75-80 online. As you can see, Hirsch calls it the Rivetta. The holes are the smaller type, with a 2mm taper on this model going from 22mm to 20mm. The sides are fully sealed and rounded, giving the strap a very finished look. The surface of the leather isn’t as smooth as I personally would have liked, but its acceptable to me. This strap is a bit stiffer than other Hirsch straps that I have purchased in the past, but not overly so. 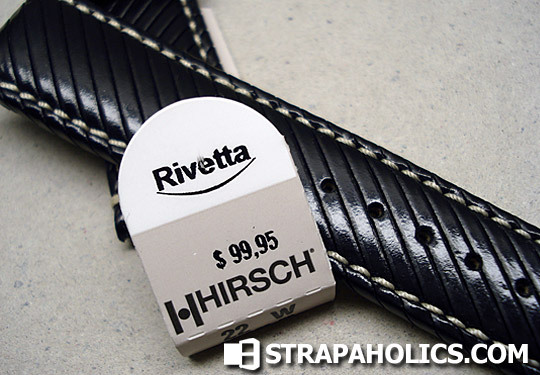 Like many of Hirsch’s straps, this one is also water resistant. I don’t really like to get my leather straps too wet, so I don’t test out the qualification. I’m sure it won’t survive a 15 minute saltwater dive, but maybe a quick submersion would be okay and a hot day of golf as well. Overall, I’m quite happy with the Hirsh, and for the $75 that I paid, its an exceptional strap. Its well made and very tough. Comfortable, but not the most comfortable strap I’ve worn – it still makes it through the day without much irritation. This entry was posted in Watch Strap Reviews and tagged Hirsch. Bookmark the permalink. Post a comment or leave a trackback: Trackback URL.